I have been using my Cameo Silhouette to make signs. How does that work? 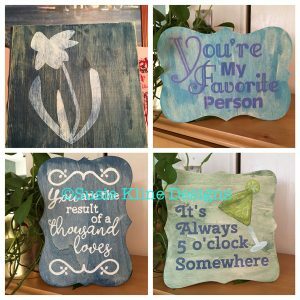 I design cut files, then use them as stencils to create the text and the artwork on wood signs. The love affair with wood is getting so serious I just ordered a nailer to use with my air compressor. Some of my pieces need frames. Frames need nails. Nails need to be driven into the wood at warp speed by air! This is just a small sample of what I’m doing. I’m designing all my own cut files. Not purchasing and using someone else’s. I’m afraid of the copyright police. And let’s not even talk about the trademark police! Yikes! I want to put these up soon on my Etsy site. Which one is your favorite? This entry was posted in signage, Silhouette by Susie Kline. Bookmark the permalink.